The two Burden factories in Troy produced 51 million horseshoes per year. The horseshoe business employed 1,400 people since, despite the use of machines, it was still a labor intensive process. Iron came down the Champlain Canal from the Adirondack Mountain deposits and coal came in from Pennsylvania along the Delaware and Hudson canal to the riverside and trackside business in Troy’s south end. 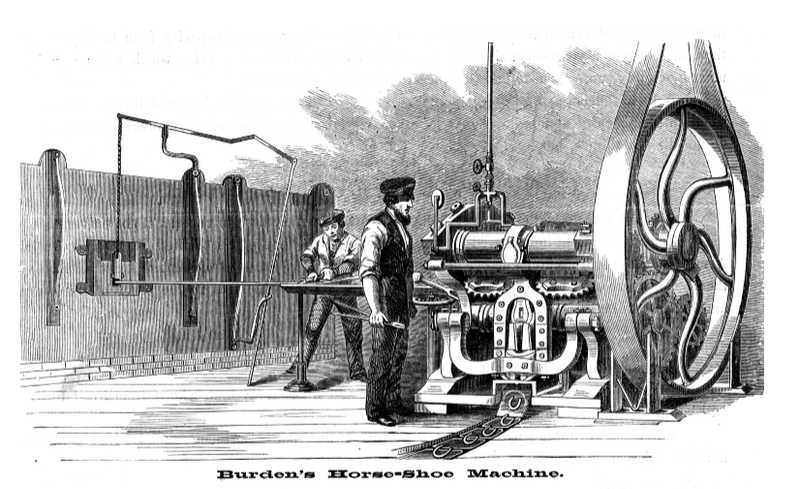 In 1835, Burden patented a machine that he would eventually improve upon, in the 1840s and 1850s, and would have the capability to make one horseshoe per second, this compared to a blacksmith who could make about 4 horseshoes an hour. The business grew from making about $500,000 in 1860 to $2.3 million in 1864. Burden attended the University of Edinburgh and arrived in the United States in 1819. Around that time, he met Patroon Stephen Van Rensselaer. There was a shortage of engineers and Burden had enormous potential. Immerse yourself in the PBS Civil War drama Mercy Street. Binge watch entire show, including two season, online.